When looking for a dumpster company it pays to ask the right questions about costs. Recently a new customer called to inquire about a dumpster. They relayed that they were shopping around because the company they previously used quoted one price and charged another much higher price. This happens far too often in our industry. The prospective customer calls and wants to know the cost to rent a dumpster. That fee is given to the customer without explaining any of the other fees that can occur. Typically there is a flat rate fee to rent the dumpster. Some companies charge delivery and pickup fees to deliver the bin to your location. They may be in the form of a flat rate fee or a zone charge. Most bins come with a weight limit. Usually one ton. If the weight of the items exceeds the one ton limit there would typically be another charge for the excess weight. There are also charges based on the number of days you have the dumpster. Most companies will give a set number of days you can have the dumpster and then charge a daily rental fee for any time in excess. Preparation is the key to saving money. Plan ahead and stage as much of the items that are going to be placed into the dumpster. It will limit the amount of time you actually need the dumpster. Understand that concrete, roofing shingles and dirt are among the most expensive to remove by dumpster. Also make sure that you aren’t adding prohibited items into the dumpster without the consent of the dumpster company. Disposing of these items comes with large penalties to your dumpster provider and ultimately to you. Most reputable companies have copies of their rental contracts online for you to review. They usually provide list of prohibited items to help you as well. To make dumpster rental simple for our clients we offer two pricing options. Option One is a business week rental of $259. It comes with a 5 day rental and one ton of debris. Option Two is a weekend rental that allows the bin to be filled over the weekend with a Monday morning pickup for $199. If you are located more than 10 miles from our Westminster, MD facility we charge a zone charge to cover the additional travel mileage and time. We post them on our website and discuss them with our clients before delivery. Both options come with one ton of debris included. Any excess tonnage is billed at the costs we incur from the landfill with receipts being provided to the customer. 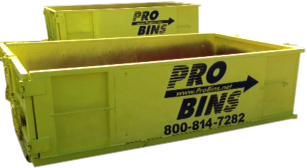 Pro Bins Now Offers Portable Storage!